Machine guidance and monitoring put you in the driver's seat to reach your highest yield potential. 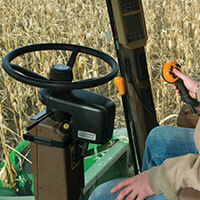 John Deere AutoTrac is an assisted steering system that automatically steers the machine through the field. AutoTrac requires a StarFire Receiver and GreenStar Display to operate. 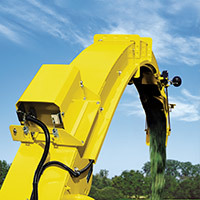 AutoTrac increases productivity, reduces input costs, and leaves an operator with more energy. The GreenStar Display coupled with an AutoTrac activation can provide automatic guidance with integrated AutoTrac, AutoTrac Controller or AutoTrac Universal. HarvestLab measures on-the-go moisture when installed on a self-propelled forage harvester (SPFH). The HarvestLab moisture sensor mounts to the top of the discharge spout and takes accurate moisture readings of the crop as it passes through the spout. Yield & Constituent Sensing can be used with HarvestLab to provide accurate predictions of starch, protein and acid detergen fiber (ADF)/neutral detergent fiber (NDF) levels in corn forage. This technology allows you to produce higher quality forage and a more-balanced feed ration. John Deere Section Control automatically turns implement sections on and off to reduce overlap and improve input management. John Deere Section Control can be utilized on planters, air seeders, sprayers and nutrient applicators on any compatible implement. Section Control reduces product overlap in the field to lower the use of product and decrease input costs. The reduction of overlap can also improve yield. 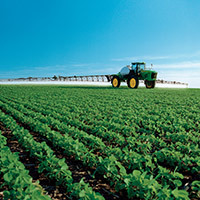 Crops sensitive to excessive seed population and product application will achieve their highest yield potential. 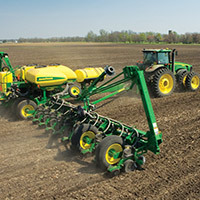 The GreenStar Rate Controller is used with Section Control to provide compatibility with anhydrous ammonia applicators, self-propelled sprayers, liquid manure applicators, liquid fertilizers, and many pull-type sprayers to automatically control application rate, document field data, and utilize map-based prescriptions. John Deere Section Control and the GreenStar Rate Controller multi-product allows operators to combine what used to be multiple operations into one, allowing such tasks to be completed simultaneously during a single field pass. Producers can utilize automatic rate and section control during four simultaneous operations.